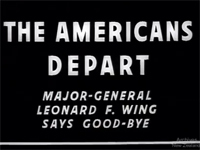 Major-General Leonard F. Wing, commander of the US 43rd Infantry Division, issues a farewell statement before his division departs New Zealand in July 1944. The members of the 43rd Division were most happy to have the opportunity to return to New Zealand again after a long period of combat in the Solomon area. Our welcome was most hearty, and everything possible has been done while we have been here for our comfort, our entertainment, and everything else that one people could possible do for another. Here in Auckland the 39th General Hospital of our Army is perhaps the finest installation of its kind anywhere outside the continental limits of the United States. The housing facilities you have provided for American servicemen while in this country have been most adequate. Your camps have been located in some of the most beautiful country that I have ever seen in any part of the world. We also had an opportunity to retrain the division for combat. The terrain, varied kinds of terrain, that we have used here in New Zealand cannot help but fit us for the next combat that we will engage in. We have during our period here, in an attempt to entertain you, had various ceremonies, parades, at which decorations have been awarded to the officers and men of this division that they earned in combat on New Georgia. The decoration day ceremony, which some of you saw, commemorates the last resting place of many of our soldier dead who will perhaps stay here as a lasting reminder of the alliance between our two countries in this great war. I want to thank the people of New Zealand for their attendance here. I also want to say one of the finest things that we have had the opportunity to do here has been to play American football. It will always be one of the most pleasant memories we will have of New Zealand – the great interest that the people of New Zealand show in all kinds of sports. We’ve enjoyed our association with your people. We have enjoyed every moment of our stay here. And now we are leaving, and I want the people of New Zealand to feel, if such be the case, that you have made a distinct contribution to my division, in its combat efficiency, and in its will to fight and to put an end to this war. My father served with the 39th General Hospital and served at the atomic bomb sites. My mother was a New Zealander.